You’ve tried to play November Rain, failed miserably, and now you are looking for easy guitar songs for beginners without a capo? Well, we have just the thing you need. For those of you not yet familiar with the device, the capo is a helpful little thing used mostly on guitars but also can be attached to banjos and mandolins for example. 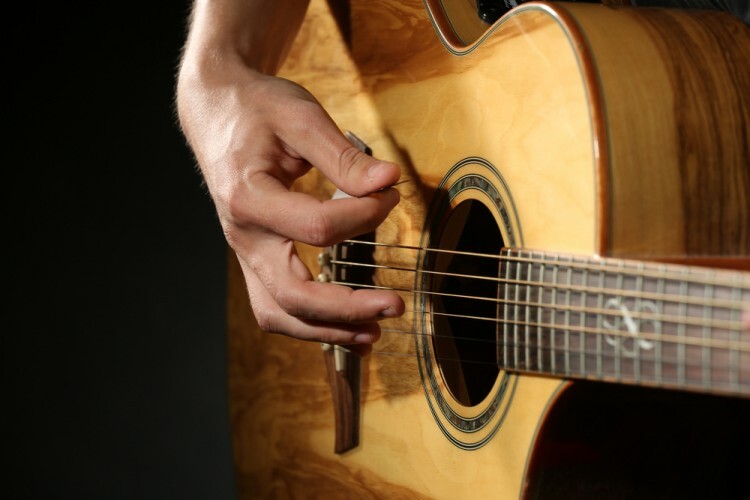 When a capo is attached to a guitar, it shortens the length of playable strings and creates a new nut. With a capo, the open strings are played in a higher pitch than usual. The use of a capo varies from music genres. For example, the device is extensively used in flamenco and country music. The jazz musicians on the other hand, rarely turn to capo. Although this all may seem a bit complicated for the beginners, it really isn’t that much big of a deal. Everything stays the same, you just have fewer frets available. Capo isn’t expensive, and it is a nice tool to have, especially if you intend to engage in playing country music. You don’t want to miss out on the opportunity to play your favorite song just because there is a capo required. Still, if you are just starting your journey as a guitar player, you should stay away from those kinds of songs, since you need to learn the basics first and get your fingers accustomed to playing more demanding chords. If you are in doubt with the songs you would like to begin, we recommend you to check out our list of 25 Easiest and Best Songs to Play on Guitar. In order to create the list of easy guitar songs for beginners without a capo, we decided to go simple. We headed out to Guitar Player Box and browsed through their database of easy guitar songs that don’t require capo. We focused on the songs that have fewer chords, while also making sure that we feature multiple genres on the list of easy guitar songs for beginners without a capo. So, check it out. 10 Easy Guitar Songs For Beginners Without Capo 2 chords guitar songs for beginners 25 Easiest and Best Songs to Play on Guitar best guitar songs without capo easiest songs to play on guitar easy country songs without capo easy guitar chord songs for beginners easy guitar songs acoustic easy guitar songs for beginners chords easy guitar songs for beginners without a capo easy popular guitar songs without capo easy taylor swift guitar songs no capo Eleanor Rigby – The Beatles chords Everyday People - Sly & The Family Stone chords Jambalaya – Hank Williams chords Jane Says – Jane's Addiction chords Knocking On Heaven’s Door – Bob Dylan chords Life During Wartime -Talking Heads chords List XFinance simple rock songs to play on guitar without capo Slideshow Sublime - What I Got chords top ten easiest guitar songs Tulsa Time – Eric Clapton chords Unknown Legend - Neil Young chords We Are Never Ever Getting Back Together – Taylor Swift chords what is capo?